Working in mobile ultrasound, you just NEVER know what you’re going to see! January’s Case of the Month had quite an interesting presentation. 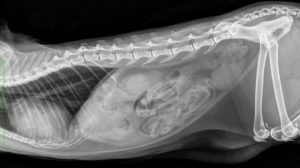 Imaging was performed by technician Amanda Lacey, SDEP™ Certified Sonographer of Animal Sounds NW in Oregon. 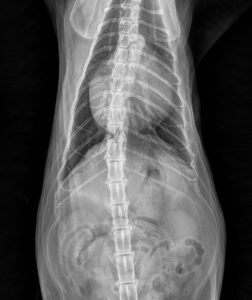 Her thoroughness, flexibility and problem-solving skills helped this patient get a quick diagnosis. When Cardiomegaly is not ‘Cardiomegaly’ what do you do? After following the SDEP™ Echo 7pt. protocol, go back to the ‘not normal regions’ and image from multiple different angles, put color on it, reposition the pet, and when you are still stumped, you phone a friend. 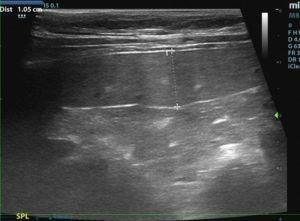 After checking images on the SonoPath clinical search for suspected hernia, Amanda decided to reach out to SonoPath specialist, Dr. Mac Daniel, DVM, DABVP, for some input on the next best step………an Abdominal Ultrasound. 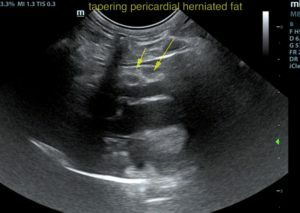 Pericardial diaphragmatic hernia – thoracic herniation of the liver – thoracic and pericardial herniation of the falciform fat. 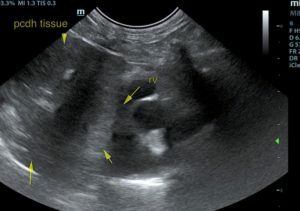 Enlarged spleen.